Sorry I have been a little absent. My dear friend started a literary journal where I am an editor and I started a new job at the reference desk at my library (yay adulthood!). In other words, like all of you out there in internet land, I don’t know where the time goes, but it must be lost in the couch, with the spare change from my jean pockets and all the good intentions I had of being more productive. I had the pleasure of celebrating the fiftieth birthday of a former art teacher this past week and was wracked with what to get her. What do you make the person who first inspired you to be an artist? Well, you give her some art. That’s what everyone else did. She got paintings and photos and sculptures. Her party was a painting party where we all made a small canvas she organized as a mural. It was pretty epic. I decided to challenge myself and make a Coptic stitch book of my poems. For some reason I thought this would be easy. I was, of course, deeply wrong. Coptic stitch is hard, but thankfully the internet is full of tutorials including a Poets and Writers Chapbook Tutorial with pictures and a wonderful bookmaker named Sea Lemon and her perfectly simple Coptic Stitch video. It was pretty do-able. My puppies are in the middle: one curious, one bored. The book was fun. I ended up making four of them: one for my teacher, one for my mom, one for my grandmother on my father’s side and one for my grandfather on my mother’s side. I found making them in two’s took minimally more time and made for a quicker learning curve. All Poets Should Bind Books. There were some key things I had never thought about before this project that I know made me more selfaware. I normally group my poems in families of ten or fifteen. In fact, I was unable to actually fill the space P&W wanted in the book (72 pages). Instead, I made it work with headers and bump (blank) pages. I had no idea how much content was needed to fill an actual book, and now I will look at my collection (which I thought was huge) with more humility. The book was too big. So I decided to make it up into 10 smaller books of five or six poems each. This took up several pages and also allowed me to subdivide the collection into smaller groups. But what would they be? What theme? What order? I imagined they would all fit together, but no, they are all over the place, I have no theme for my collection. I have been hanging on the idea of ‘skepticism’ in my earlier chapbooks. The poems that I chose went along with this sense of surprise in ordinary moments, but that didn’t go very deep into the collection. I was in need of something different, something bigger. The collection is called Lucid Dreaming, and the books are named after the ten-ish steps of actually having a lucid dream. I needed to take a step back and think about what would fit the whole group rather than just the ten books individually. It made me think of writing essays in college, picking a topic big enough, with enough depth and content to get a 20 page paper out without being redundant. Lucid dreaming was actually something I go pretty good at during college and looking back it fits the poems perfectly. It is both tangible and ephemeral, with a strong sense of self and no sense of place, just like the voice in most of my poems. It was also unrelated enough to inform the poems without stealing their thunder. It cradled the poems that seem stranger than reality and made fantastic the poems that are too near to reality. I had to step outside my own mindset to make the poems work together. It’s been a while since I was wrist deep in rubber cement. I had forgotten how gritty reality can be. Poetry, for me, had become this alternate, bodiless at times, existance with a shiny screen and a slick clicking keyboard. It wasn’t real. It meandered from my mind onto a surface I could neither touch nor fathom. But books are real. And so are sewing needles and paper cuts and spilled glue and knotted up thread. It was a rush of reality to my otherwise unworldly typings, a long overdue splash of life. Sewing is like the lungs when the breath absent-mindedly. 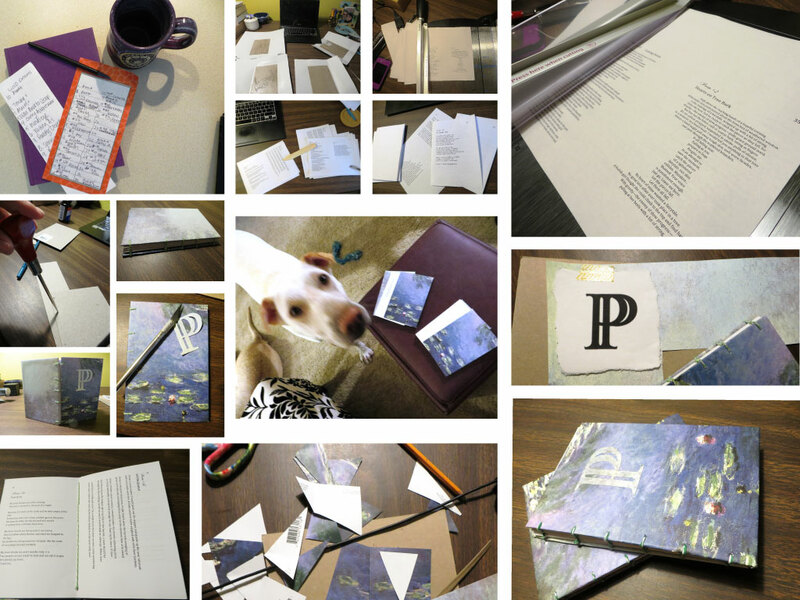 I had no idea how satisfying and deeply moving making my own books would be. I am obsessed. I encourage you all to either look at these tutorials or consider making books on your own. It made me reconsider what poetry means for me, and what I want to be as a poet. Plus holding a book of you is a sobering feeling. Here is a good example of a poem which made a 100 degree transformation in the name of a better idea. Sometimes there are poems that start out one way and basically need to get naked to improve. Like taking a shower. Except of course that shower is going to get rid of all the junk in the poem and not BO, but maybe a little of that too. So this poem, like it says above, this was from reading a lot of Virginia Woolf. And while I LOVE VW with all my heart she does make me a little dark. So the idea here is growing together. The subject in the poem above is having issues with that togetherness, it brings her down. The subject in the revised version is having a fine time, as a mangrove instead of a victim, the togetherness feels more natural and less forced. This brings me to my biggest challenge as a poet these days. Make the poem a positive experience for everyone. In the past my work has been a little stark, having shocking images and sometimes fringe subjects in terrible situations. I think this was because I was changing, growing, finding my voice. The old joke in poetry, at least amongst my friends, has been about that angsty teen poetry that makes the world feel aweful and dark and sad. I think mine was not too far from that category, using more complex words and deeper themes, the sentiment was similar. A moment that makes a poet write a poem is vital, but not all poems are vital to that moment. We are at the mercy of the muse, but that experience is ephemeral, unlike the poem. For this poem, the process is vital for making the real crux of issues find a better entry point: through wisdom rather than passion. Poems change because the poet changes. That’s why we edit. Never take for granted the power of a good long second look. The results will suprise you. Some poems never change while others make a giant leap into new territory. Don’t fret. 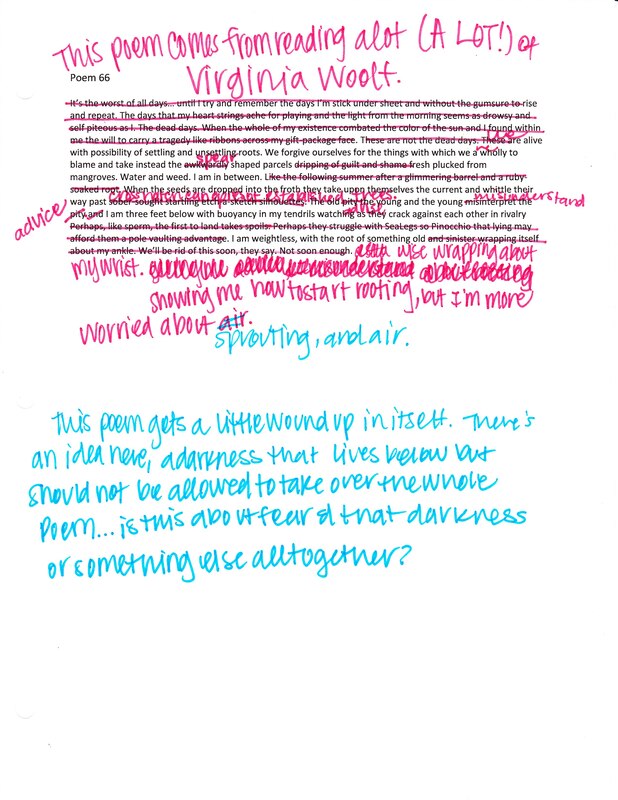 The poem will always be moving toward its best version, the job of the poet and later the editor, is to make that better state a waking reality through concentrated changes and open mindsets. I am pleased to announce the launch of our official website: Noble / Gas Qtrly, coinciding with the start-gun of our premier competition: Natural Selection. Fight in the first competition of Noble / Gas Qtrly, Natural Selection, where your poetry or prose will face off against other submissions for a chance at victory. At long last your work may reign supreme. The site is now officially open so please join us for the first round of submissions and let the battle begin! If you have any questions or comments leave your two cents below and I will get back to you with all the details I know. The first issue is set to rumble through in October, so ready your helmets; it’s going to be one hell of a safari!